Black mold is a toxic fungus that grows in buildings and homes that have water problems, such as damage from flooding or an unknown leak. Black mold produces spores to reproduce, and these spores can cause health problems in people ranging from hay fever-like respiratory problems to skin rashes. The symptoms of black mold exposure are largely the same in children as in adults, although children can be at risk for more severe complications. If your child inhales the spores from black mold, he may experience respiratory problems similar to those from seasonal allergies. This includes irritated eyes, a runny nose and sneezing. Your child may also experience throat irritation and a cough. 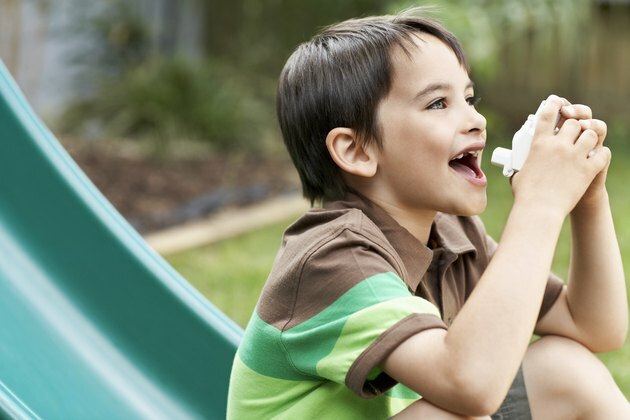 If your child has asthma, black mold spores may trigger an attack or exacerbate an existing attack. If your child's skin comes into contact with black mold spores, she may experience irritation and itching. Black mold has also been known to cause skin rashes, according to the Environmental Protection Agency. Some research suggests that infants exposed to black mold may be susceptible to a serious lung condition called idiopathic pulmonary hemorrhage, or IPH. IPH is acute bleeding in the lungs that can quickly lead to respiratory distress. The Centers for Disease Control investigated clusters of this illness in the early 1990s in Cleveland and Chicago that appeared to occur in homes where there had been water damage and a proliferation of black mold. However, the CDC cautions that a firm association was never proved and further study is needed to confirm the link between IPH and black mold. Since black mold acts like an allergen, different people can react in different ways. Other symptoms that may occur in children exposed to black mold include headaches, memory loss, nosebleeds, anemia, nausea and vomiting. Florida Department of Health: What Health Problems can be Caused by mold?